Amongst her many talents in life, my Mum is an excellent Easter bunny. Discovering colourful, foil-wrapped eggs in unexpected places is an annual occurrence in the little loaf household. Despite the fact that my brother and I are adults (with our own flats and jobs and lives outside of our family home), my Mum still manages to sneak us a bounty of chocolate treats when we least expect it. In fact, the bigger the challenge, the more I think she relishes it. Easter eggs have appeared in bathroom cabinets, unopened suitcases and, on one memorably sticky occasion, in my beach bag on holiday in Antigua. This Friday just gone, my parents came round for dinner. After they’d left I headed into the bedroom only for my eye to be caught by the shiny glint of foil from the bedside table, the bookcase and – when I shook out the covers – even tucked underneath our pillows. The Easter bunny Mummy strikes again. Whether or not your parents and family are quite as devious when it comes the giving of eggs at Easter, I imagine the majority of you may have consumed your fair share of chocolate this weekend. Not to mention the family roasts, chocolate nests, slabs of Simnel cake and obligatory hot cross buns smothered in butter. Easter is all about indulgence, but the morning after, you might just be craving something a little lighter. This bircher muesli is one of my favourite breakfasts at the moment. Prepared the night before, I can pop it in my bag to eat after the gym in the mornings, or enjoy it at leisure on the days when I’m at home. 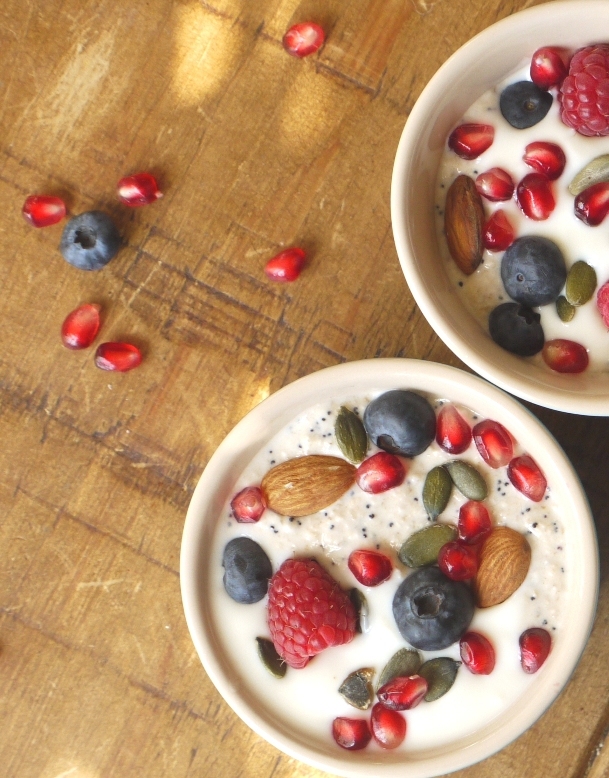 It can be thinned down with milk (or a dairy free alternative), thickened with yoghurt then stirred through and sprinkled with any combination of berries, nuts and seeds for juiciness and crunch. In the winter I grate a little apple or pear into the mixture, at the moment I’m enjoying beautiful beads of ruby red pomegranate and as cold of winter fades, I’ll be introducing strawberries, peaches and more to make a colourful bowl of breakfast goodness. Greek yoghurt is my staple addition, but if you’re feeling incredibly indulgent you could stir through a spoonful of cream which will make it taste a little more like the Bircher muesli you may have eaten in restaurants. Muesli can get a bad name for being boring, but this Bircher version is anything but. Creamy, sweet and utterly delicious, it’s the perfect way to start a wholesome, healthy week after Easter. Until you discover that hidden chocolate egg down the back of the sofa, that is. If you like your bircher muesli soft and pulpy, mix the wet ingredients together the night before you want to eat it. If you prefer a little more bite, it’s fine to make it 30 minutes or so before serving. I sometimes substitute the oats with quinoa flakes or throw in a handful of rye flakes – as long as you stick with the basic ratios, this recipe really is extremely adaptable. In a medium sized bowl, mix together the oats, juice, milk and poppy seeds. Stir to combine then set aside. When ready to serve, stir through 3 tbsp of yoghurt or until you achieve a consistency you like. Mix through most of the seeds and nuts, reserving a few to sprinkle on top. Divide the mixture between 6 small bowls. 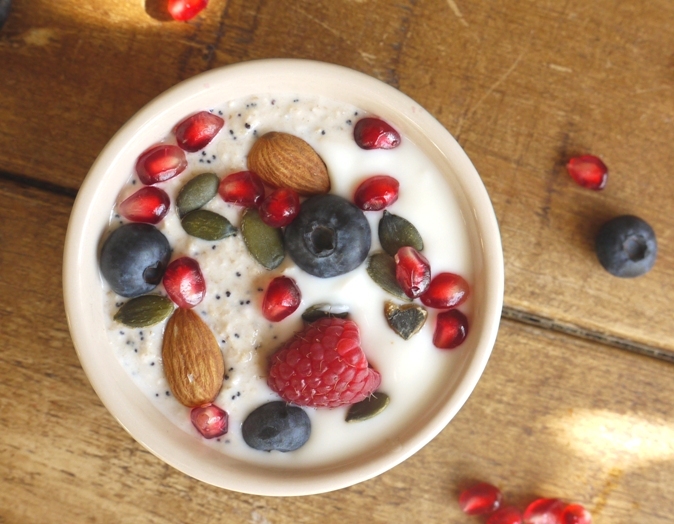 Add an extra dollop of yoghurt if you like, then scatter with berries, pomegranate and the remaining nuts and seeds. Add a little drizzle of maple syrup, although if the fruit is perfectly ripe, you probably won’t need it. Serve immediately with juice, coffee and any other favourite breakfast accompaniments. Thanks for sharing! I certainly need something healthy and virtuous after this weekend! Have a look at our latest post straight from Barcelona! I’m not a fan of milky things, but I like the IDEA of Bircher muesli! 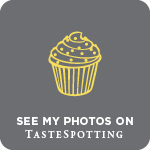 Lovely photos too! Beautiful photo’s! Off to play at Easter Bunny now! My mom similarly surprises me each year with Easter baskets filled with various treats, despite the fact that i am 30 years old, live in my own apartment, and am engaged. There’s nothing like it though, i guess moms with never stop being moms – and so they shouldn’t. I love the muesli as well, beautiful! Mmmm… oats with nuts, berries and yogurt is probably my favorite thing to eat as a first meal. I don´t say breakfast because that´s just coffee for me. And your mother´s easter story has got to be the sweetest! And she still does it, how wonderfully caring of her! My kind of breakfast! Lovely!! Beautiful! And how did I make it all weekend without a single bite of chocolate? Now I’m feeling very deprived. I love muesli and never would have thought to mix in apple juice or grated pear! Great way to start the day. 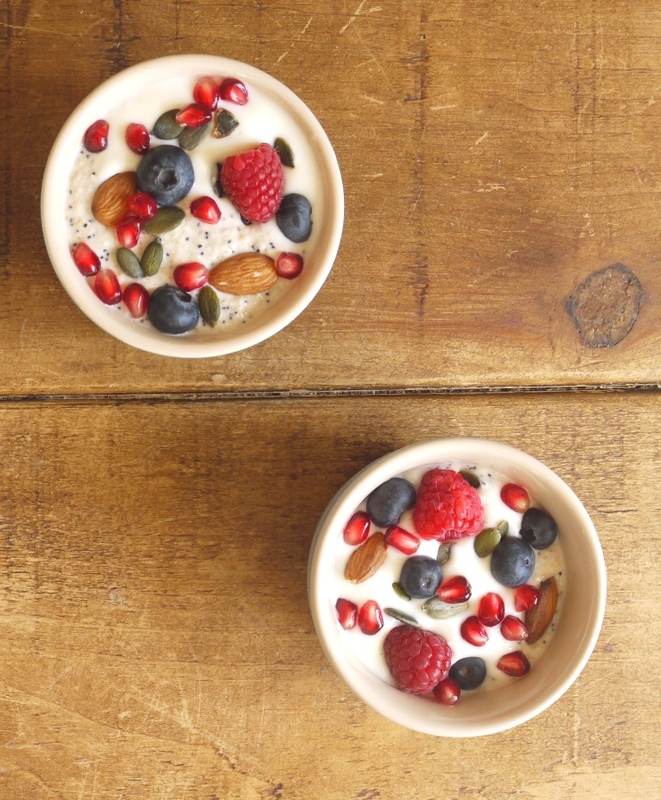 Your muesli looks so good! Healthful comfort food… something we all need after the Easter indulgences. Your Easter Bunny mom story was so cute. I hope my kids feel the same way about me someday. I’m all for magic. I’m sure they will Erin, it sounds like you’re a wonderful mother. Here’s to magic in everyday life. Just my sort of breakfast, especially after all that chocolate! I was really pleased when my 5 year old daughter recently enjoyed her own mix of this (I suggested she could add her favourite seeds, nuts and fruit) but I think she’d be even more enthusiastic about chocolate eggs under her pillow. Your mother sounds like a great mom! I love muesli and would appreciate a bowl any morning. My mother still gives me treats for Easter too (though she doesn’t hide them, she presents them to me), and it’s always a surprise what she’ll come up with. I have to say, I’m spoiled with some high-quality Easter Candy :). Oh, this muesli is far from boring and looks just fabulous. I’ve just started a new healthy living menu for myself and this is definitely going to be a part of it! This looks so healthy and yet delicious, the best kind of recipe. 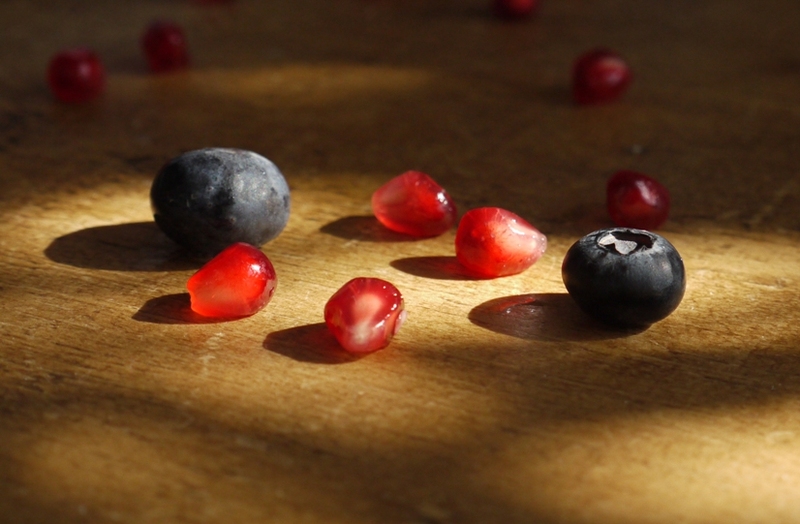 Those berries are gorgeous! So lovely with the pomegranates- a lovely thought (and gosh, isn’t your mum a keeper). You really have the best breakfasts ever. This looks so tasty! 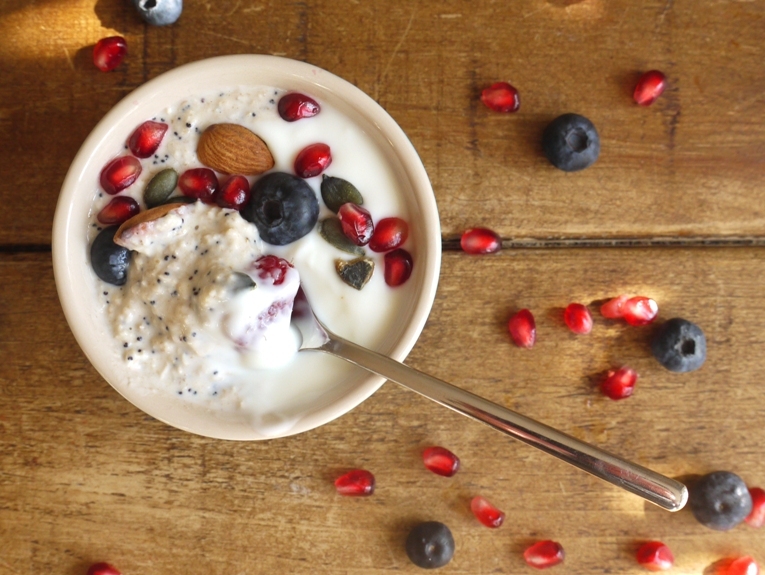 This muesli looks far from boring – love the texture and pop of blues and reds! I couldn’t agree more with all the comments above- and indeed the is the perfect post gym treat! I just had this for my breakfast! It was delicious,it feels like a healthy treat which is perfect after a morning yoga session! thanks for sharing the recipe! Love Bircher Muesli. Usually go the grated apple route, and add a squeeze of lemon, plus hazelnuts, yogurt, and fresh fruit. This is my perfect kind of breakfast! Yummy! Have you tried using another kind of berries?